Kanban is a framework for agile development. Tasks are displayed on a board with multiple columns (or lanes) that can be labeled to show the progress while working on your task. The steps each tasks must pass through are reflected on the board from left to right. 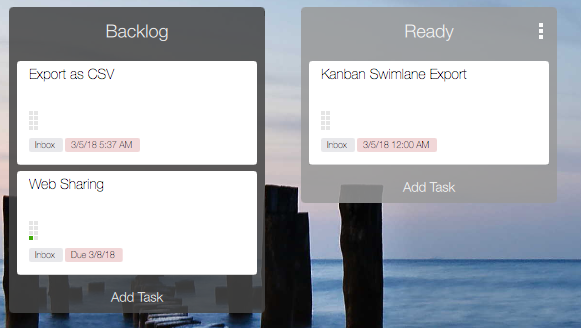 Every project and the Inbox can be displayed with Kanban style Swimlanes. The Top Bar contains the view selector on the right side. 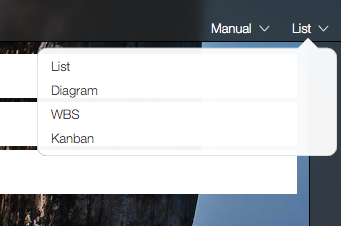 Tap or click it to show the view styles and select "Kanban". The first lane on the left side is always the "Backlog" lane. This lane collects all tasks on which no one is working yet. As soon as you start working on your tasks you move them to the right - lane by lane, till the task is completed. The steps necessary to complete your tasks are defined by you based on the things you want to accomplish. If you are in software development typical lanes (steps) could be "Ready", "In Development", "Development Completed", "In Testing", "Testing completed", "In Release", "Done". Tap or click "Add List" to add a new Swimlane and enter the Swimlane title. If you want to change the swimlane order later, tap/click and hold the swimlane title till you see the frame color change, then drag to the left or right to move your swimlane. To change the swimlane tap or title click it once to start editing or select "Rename List" from the "more ..." menu on the top right of each swimlane. Additionally you can change the background color for each lane or delete a swimlane from the "more ..." menu as well. Now it's time to put your new setup to work. Add tasks by tapping/clicking on "Add Task" at the bottom of each swimlane. In most cases you will do this in the backlog, unless you start working on a new task immediately. As soon as you finished a step for your task, tap/click an hold it until the color changes and drag the task to the next swimlane. You can also drag your tasks up or down on a swimlane to sort the tasks in each lane. To open the Task Details Inspector either tap a task (on mobile platforms) or open the Task Details Inspector sidebar on the right side (on desktop platforms). Set all task details, like reminders, contexts, due date, from the Inspector or complete the task from the Inspector. After completion your task will be removed from the board, but it is still listed in the "Completed" section (Library sidebar on the left > Projects). 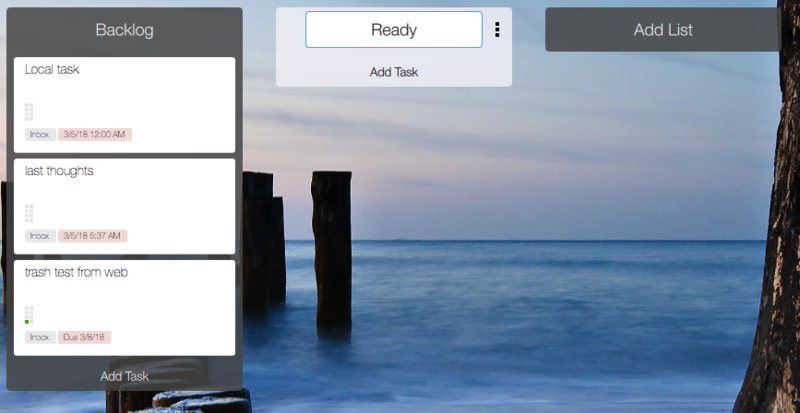 If your task has a thumbnail image it will be displayed automatically on the Kanban Board as background image. To set a thumbnail image add an image as attachment to your task (using the Task Details Inspector), then expand the attachment section in the Task Details Inspector to show the list of attachments, select any of them and tap/click "..." on the right side. Select "Set as Thumbnail" from the menu.